With the Network and Enterprise versions of TypeItIn you can share groups of buttons with other TypeItIn Network or Enterprise users. To get started, switch to the group you want to share, right click on the Group List, and select Export group to file from the menu. In the Export dialog navigate to the folder where you want to store the shared files. You can store it on a FLASH drive if you simply want to transfer it to another computer, or on a folder on a network drive if you want to share it with a number of users. 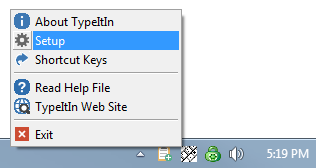 Make sure the Save as type is set to TypeItIn Group Files (*.tgf) and click the Save button. 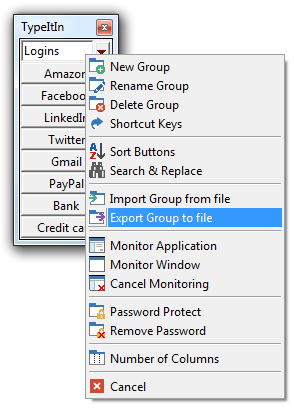 The Group Export Options dialog allows you to specify what items are exported. You can Password protect the modifying of the group. When the group is imported TypeItIn will ask for the password. If the password is not entered or is incorrect, the user will be able to use the group, but not edit the buttons. You can also delete a previously shared group from the remote computer(s). Click OK to save the group file to the specified location. This will create two files, a .tgf file (logins.tgf in this example) and a TypeItInList.tgl file. The tgf file and be used to import the file manually into another copy of TypeItIn. The tgl file is used in the automatic sharing of groups. 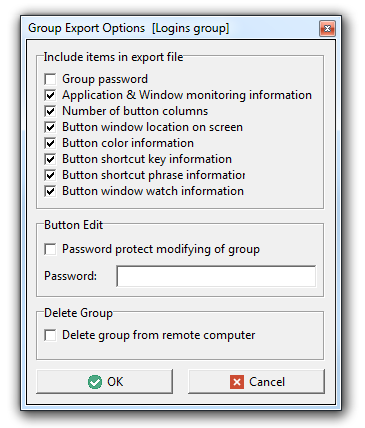 To share a group manually, right click on the Group List of the TypeItIn you want to share the group with and select Import group from file from the pop up menu. 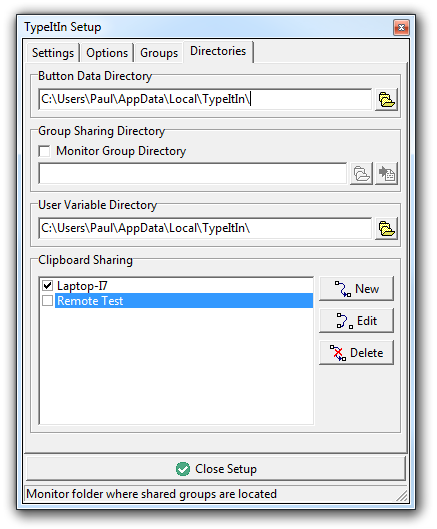 Navigate to the FLASH drive or shared network folder where you saved the group file to and select it from the list. Click the Open button to import the group. 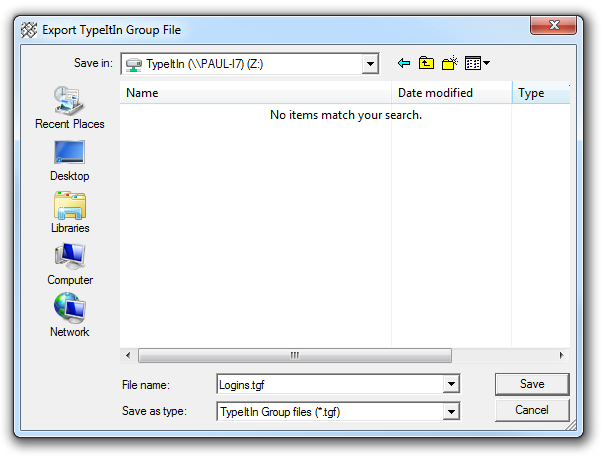 To share a group automatically with another user you have to configure that copy of TypeItIn to monitor the tgl file for new or modified group files. In the copy of TypeItIn that you want to share the group with, right click on the TypeItIn icon in the task bar tray and select Setup from the pop up menu. In the TypeItIn Setup window switch tot he Directories tab. In the Group Sharing Directory section check the Monitor Group Directory box. 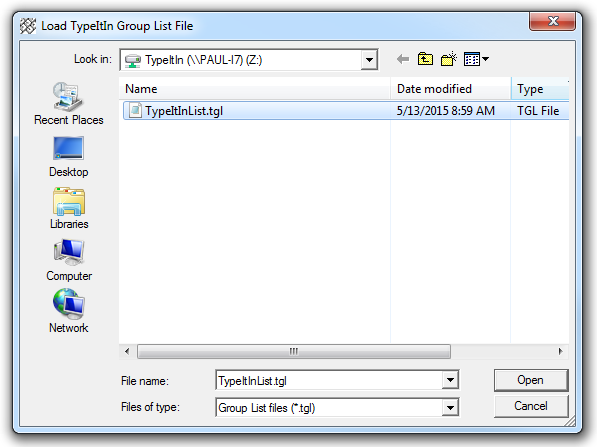 In the Load TypeItIn Group List File dialog navigate to the folder where you saved the exported group file. Select the TypeItInList.tgl file and click the Open button. A dialog will pop up asking if you want to import all the groups listed in the tgl file. Click Yes to automatically import all the groups. TypeItIn will now check the TypeItInList.tgl file every 10 minutes for changes. If the original user makes a change to the group and exports it to the same folder, this copy of TypeItIn will automatically import the changes.